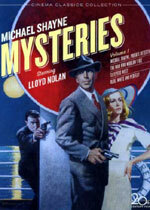 adapted as "Michael Shayne Mysteries Volume 1"
Only one of the movies in this DVD set (Michael Shayne: Private Detective) was based on a Halliday novel: Dividend on Death. The Man Who Wouldn't Die is based on No Coffin for the Corpse, a Merlini the Great mystery penned by Clayton Rawson. Sleepers West was a remake of the 1932 Fox romantic drama Sleepers East. 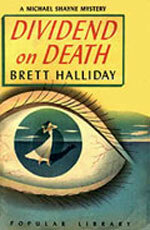 Blue White and Perfect was based on a pulp series novel by Borden Chase.